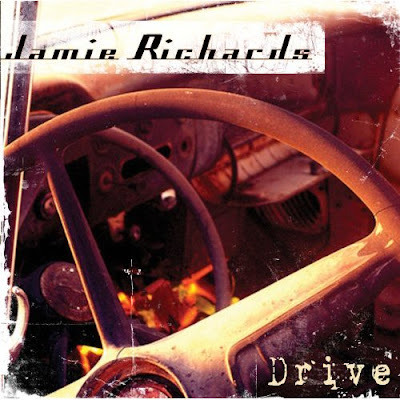 We were pleasantly surprised to find a copy of Jamie Richards' fine 2007 release "Drive" waiting for us in the office mail last week. So, of course, we listened to the D Records release most of the day and were thrilled to hear that the third single from the album, "Back To Bein' Me," has been released to radio. This comes on the heels of Jamie's success with his title track,"Drive," which vaulted to Number One on the Texas Music Chart and the Texas Regional Radio Report earlier this year. As many of you know, Jamie Richards is an Oklahoma boy who grew up working on a dairy farm. We can't think of any finer upbringing for a future Texas country star who eventually found his way to Curb Records as a staff writer. Like the title from one of Jamie's songs, his life was a "Country Song Waiting To Happen." Jamie Richards is a traditional country artist who confidently sings the lyrics he writes while rejecting pop-influenced country. Since some people are only just discovering "Drive," we recommend this CD as a perfect gift for any classic country fan. "Back to Being Me" is an upbeat tune that is perfect for this season and upcoming New Year's resolutions. As we take inventory of our lives, Jamie song encourages us to find ourselves and be true to ourselves. Jamie Richards is not a man who fears the machine or cares what “they” think. With boldness, Jamie dares to go where most have drifted from; traditional, honest, down right real country music. With his sophomore release, Between These Lines, he exposes a little bit of his soul and turns out a masterpiece that reflects the road he has traveled. Born and raised in Oklahoma, Jamie grew up on a working dairy farm owned by his family. He cut his teeth on gospel music singing with his mother while she played the piano. “I got my talent and love of music from my mother and my bulldog mentality for never giving up from my dad,” says Jamie. After eight years of getting his musical education in Oklahoma honky-tonks, Jamie ventured out East to Music City. With little more than a couple hundred dollars and a lot of pride, he rolled into Nashville but found that the city doesn’t always welcome real country singers with open arms. Everyday Jamie watched great singers leave town, discouraged by the corporate nature of Music Row and the pop-influenced sound that was being made mainstream. Unaffected by the manufactured nature of Nashville, his bulldog mentality and perseverance paid off. His mastery of the songwriting craft caught the attention of Curb Records who offered him a position as a staff writer. For almost five years, Jamie played the part of prolific staff songwriter for the mega publishing company, securing cuts with major label artists and several motion pictures. During his tenure, he was offered several record deals. All of the opportunities started out with the same promise but ended with the fear that Jamie was “too country.” Never one to compromise his beliefs, he dismissed their ideas of turning him into another cookie cutter country hat act. At the same time that Nashville was turning up its nose at traditional country music, a legendary record label in Texas, D Records, was looking for the next voice to bring back the roots of country. In 2000, Wes Daily reactivated the label, hoping to follow in his grandfather’s footsteps. “Pappy" Daily, founder of D Records, was famous for launching the career of George Jones. Jamie fit what Wes was looking for to a “T;” straight-up, life-telling, soul stirring country music. Jamie’s debut album, No Regrets, was an instant hit, producing two Texas Music Chart top ten singles. He found his home in the camaraderie of other Texas/Oklahoma artists, collaborating or performing with artists like Kevin Fowler, Walt Wilkins, Jason Allen, and Cooder Graw. With open arms and warm hearts, Texas has embraced his honest and edgy songwriting approach. The album’s tracks range from rowdy, like the debut single, “Wasted” to the beachy feel of “Someday.” Written with Wilkins, “Someday” speaks about the desire to getaway; in this case, the Gulf of Mexico. In Jamie’s more serious “Back in Oklahoma,” his father’s memories take him back in time on a journey through his father’s life. “Every Single Day” stands as Jamie’s self-portrait and most revealing piece. Finally, after the years of struggle and disappointment, Jamie has found a place that craves the art he creates. He may not be at the Grand Ole Opry in Nashville, but he’s played the Opry in Texas they call Gruene Hall. It’s a refreshing change of scenery from the cut throat trenches he’s lived through. He may have taken a longer detour than most to get here, but this Oklahoma story teller’s music finally found a home.